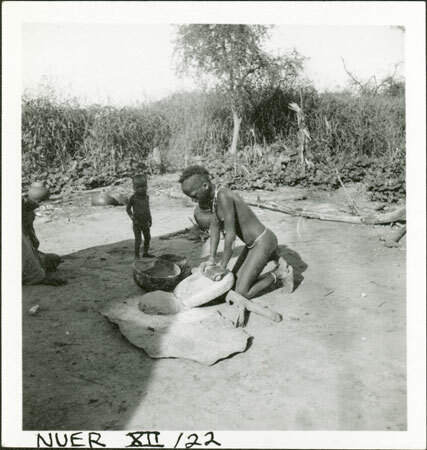 A kneeling girl grinding flour paste on a hardened mud base set at an angle to let the flour fall down onto a leather mat. Next to the grinding board are two large gourd vessels. The location is possibly among the Gaajok at Mancom near the mouth of the Nyanding. Note on print reverse ms pencil - "41 2" & print front border ms ink - "NUER XII/22"
Morton, Chris. "Nuer girl grinding" Southern Sudan Project (in development). 03 Jan. 2006. Pitt Rivers Museum. <http://southernsudan.prm.ox.ac.uk/details/1998.355.557.2/>.